As a sewer whose main objective is to make garments for myself and family, in any given day the fabric types that I sew with can range from the lightest of silks to the heaviest of denims. Although I can’t say that I often encounter quilting cottons, occasionally a friend may request some manner of garment from a firm cotton. Here I will be discussing those fabrics that can make any garment sewer throw in the towel, whether advanced or beginner. 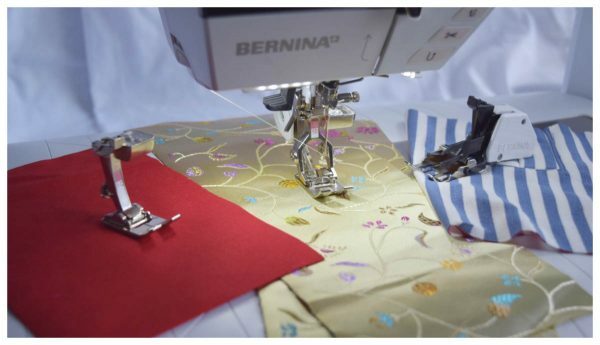 I want to help others who sew mainly garments to understand the difference from a standard machine foot and the need for a specialty foot such as the BERNINA Dual Feed (BDF) and the BERNINA Walking foot #50. Standard feet work great when you are just learning. Just like a “first car” when you are starting out—these feet will give you even pressure when sewing any project. 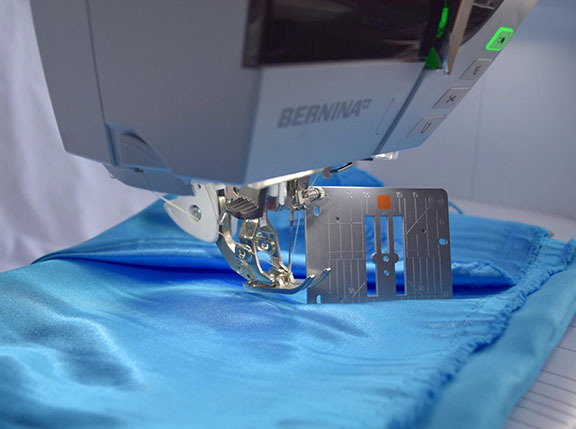 As your skill improves and you grow and advance to more intricate, creatively challenging garment sewing, you will also find it useful to go further with your tools – mainly your machine feet and other accessories. To know when or why to use different presser feet, one must first understand the basic functions of the presser foot and feed dog. In this case, know how the different layers of fabric move under the presser foot and over the feed dog. Differential Feed is the “how.” Simply put, differential feed means that the fabric layers are fed at a different rate through the machine at the point of contact with the feed dog and the presser foot. The top layer moves at a slightly slower rate than that of the bottom layer which is being helped along by the feed dog. No matter what you do, or how much you pin, the fabric layers will tend to come out different, one longer than the other. 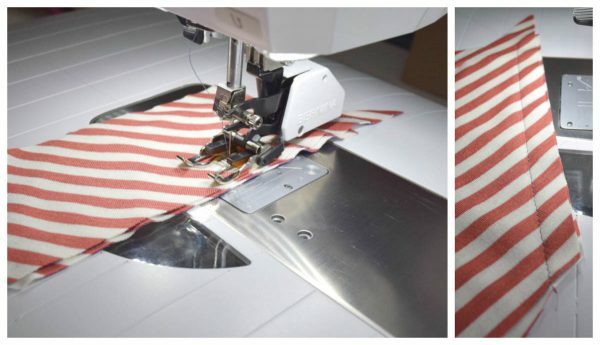 Zippers, stripes, and pattern matching can become problematic. Although all perform reasonably well in any situation, as with the standard presser foot, both the Walking Foot and Dual Feed Feet may require some special handling when working with the many different fabrics we face in garment sewing. These fabrics are especially prone to damage, so special considerations need to be taken when stitching. Use the Straight Stitch Plate; the opening on the sole will also work with the 5.5 mm Stitch Plate. Place light weight tissue paper on top and below the seam to be stitched if the fabric is especially prone to damage from the teeth of the feed dogs. Use a needle comparable to your fabric, usually a 70/10 Microtex Sharp. Use a straight stitch/single needle position presser foot such as Jeans Foot # 8D, Straight Stitch Foot # 13 or Patchwork Foot # 37D. 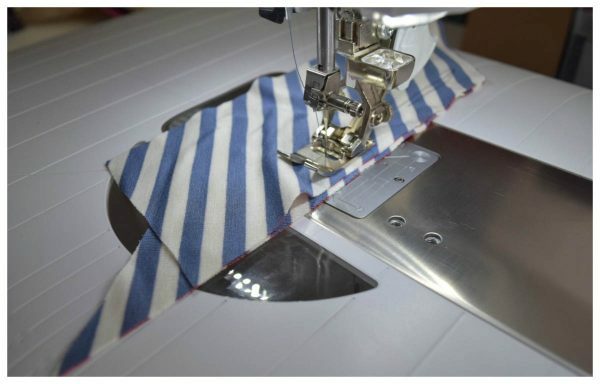 The 5.5 mm Stitch Plate along with a foot which has the same sole opening—is needed when using a zigzag stitch on these fabrics to help avoid pulling the fabric under. Consider using french seams in your final construction due to fraying tendencies. Use a needle comparable to your fabric, usually a 10/70 Microtex Sharp. Use the 5.5 mm Stitch Plate to match the opening on the sole of the walking foot. Consider using an adhesive glue stick to secure the seams inside the seam allowance. This may be especially necessary when sewing on the bias. 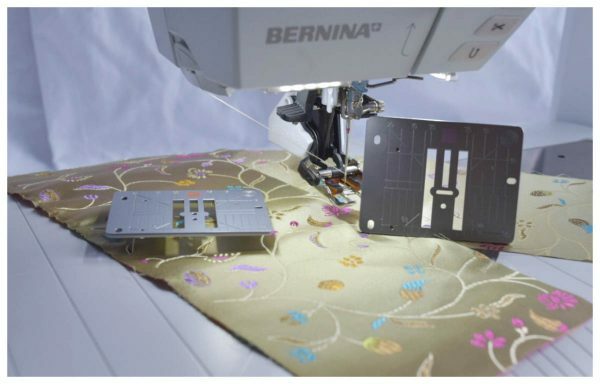 NOTE: Because of the tendency for knits to be further stretched during seaming, the BERNINA Walking Foot #50 would be your best choice. This is especially the case when working with ITY Knits due to there extreme stretch. Lower the pressure of the presser foot to avoid “pushing” added stretch into your seam. Consider using a temporary adhesive inside the seam allowance to avoid shifting on bias seams. Use the Zigzag foot with non-stick sole #52D to alleviate any “drag” on the fabric. 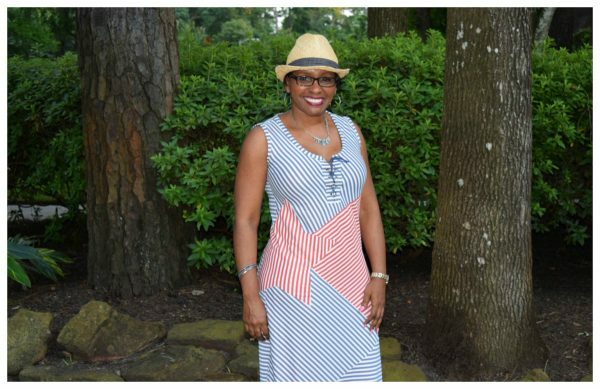 Read Andrea’s blog “Sew-To-Fit and learn more about her process as she constructs her garments (such as the construction of this Independence Day dress) and learn about the details of fashion sewing as she shares how she makes optimum use of her BERNINA 780 sewing machine. This was very helpful. I have the 830 and was told that I do not need a walking foot because dual feed fits all needs. Do you agree? Hello Karrie, the dual feed system can definitely stand on its own. However, for me I have found when working with any stretch fabrics especially fine silk jerseys and lightweight knits such as tricot and rayon jerseys–the addition of those little front teeth on the walking foot actually help keep these fine fabrics from stretching and puckering. Thank you for the info. I have the walking foot, but will the 97D work the same?